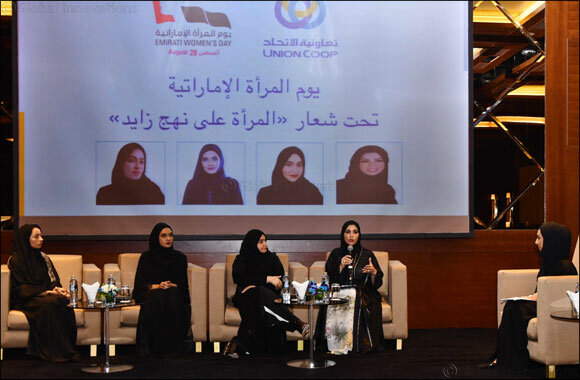 Dubai, UAE, August 29, 2018: ‘Union Coop’ celebrates the fourth annual Emirati Women's Day as a tribute to their accomplishments and hard work that they have carried out in promoting the development of this great nation across many different sectors. The ceremony, held at ‘InterContinental Dubai’ – Festival City, was moderated by Amal Ali Al-Muaini, News Presenter at Sharjah Radio, with HE Dr. Azza Suleiman Bin Sulaiman, Member of the Federal National Council. The chief guest of honour included Dr. Nabila Al Awadhi, the first Emirati aviation medicine physician in the UAE, Ms. Jawaher Salim Bilal Al Muhairi, UAE Youth Ambassador and Youth Representative abroad, and Ms. Anoud Mabrouk Al Saadi, UAE Fencing Champion. “Union Coop continuously strives to contribute to the leadership of H.H. Sheikh Khalifa bin Zayed Al Nahyan the President of the UAE and H.H. Sheikh Mohammed bin Rashid Al Maktoum, the Vice President and Prime Minister of the UAE, and ruler of Dubai, H.H. Sheikha Fatima bint Mubarak, Chairwoman of the General Women's Union (GWU), President of the Supreme Council for Motherhood and Childhood and Supreme Chairwoman of the Family Development Foundation (FDF), in enhancing the presence of Emirati women by supporting their empowerment programs and involving them in all major development programs as well. Union Coop employs 204 female employees, of which 123 are citizens at present, and provides full support in the form of necessary training courses that help them excel in their respective careers,' added Al Falasi.